This week we were lucky enough to attend the Press Briefing for what just might be the greatest exhibition of Abstract Expressionism for sixty years. The Royal Academy of Art has amassed an immense collection of American works from galleries and private collections (over 100 lenders in total!) which include works by great artists such as Clyfford Still, Mark Rothko, Jackson Pollock and Janet Sobel to name just a few. Abstract Expressionism is widely known as a ground-breaking moment in the formation of modern art. Artists no longer wanted to recreate scenes from life but wanted their spectators to experience paintings physically - for us to 'feel' their emotion through the medium of paint, sculpture and so on. Their often aggressive gestural marks also filled the entirety of the canvas, dispensing with the traditional ideas of composition and geometry. 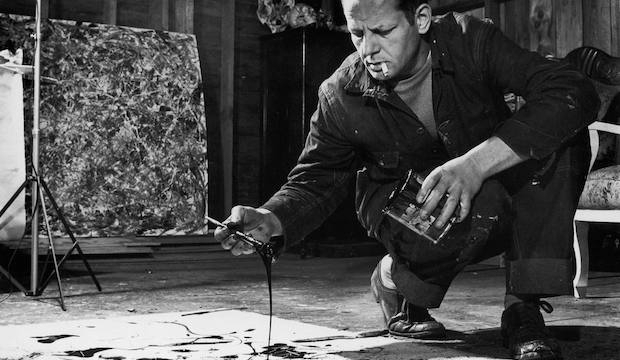 Artists like Jackson Pollock poured, dripped and spilt paint, pushing materials to become free and almost overtake the artist's hand. What was also revolutionary about this way of working was that by desiring physical feelings from their viewer, the Abstract Expressionists weren't creating work just for academics or theorists, but art for all. There will be some extraordinary works on display - icons from the movement by the likes of Pollock and Rothko. There's also an assurance that the gender imbalance will be rectified by the inclusion of significant female painters including Janet Sobel and Pollock's wife Lee Krasner. The curator David Anfam told us he hopes the viewer will be 'immersed in colour'. This is set to be not only the show of the year, but one of the world's most comprehensive displays of American Abstract Expressionism. The exhibition will open in September this year - it'll be worth the wait, we promise!